Xenarc introduces one of the world's most powerful mini Fan-less PC. Like its name, the PC doesn't use a Fan for cooling but it is still able to operate at a 120 degree Fahrenheit environment. This PC uses a Socket 478 Intel Mobile Celeron (Pentium M Class) 1.73GHz processor. The unit takes 12 Volt DC, and we are able to cut power consumption to less than 40W with our proprietary technology. Shock and vibration is handled by its 2.5" slim Hard Disk Drives or a flash SATA drive (DOC, DOM) can also be installed to make the unit a completely non-mechanical PC. 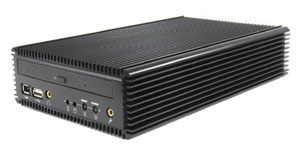 This low power consuming, but yet powerful PC is perfect for in-vehicle computing or industrial computing use. You can install your choice of a CD-ROM, DVD-ROM, DVD-ROM/CD-RW, or DVD-RW drive. Can't believe we can pack that much power into this little box? See it yourself. This PC comes included with an instruction manual, CPU Heat Sink, an AC adaptor, and drivers CD. Couple this Mini Aluminum PC with our 7-Inch VGA Monitor, Model #700YV or Model #700TSV for your various mobile and in-car computing needs. 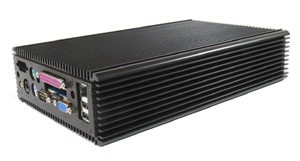 Add an optional PSU-PC12 In-Car Computing Power Supply Unit with intelligent shut-down controller for use inside a vehicle. Compatible Processor #: 410, 420, 430, 440, T2300 and T2400 CPU.